Sample sale alert! I am as addicted to cute workout clothes as I am to Class Pass, so naturally I like to be on the pulse of cute athletic apparel sample sales. I’ll be sharing them here and on Instagram and Twitter with you as I hear about them. 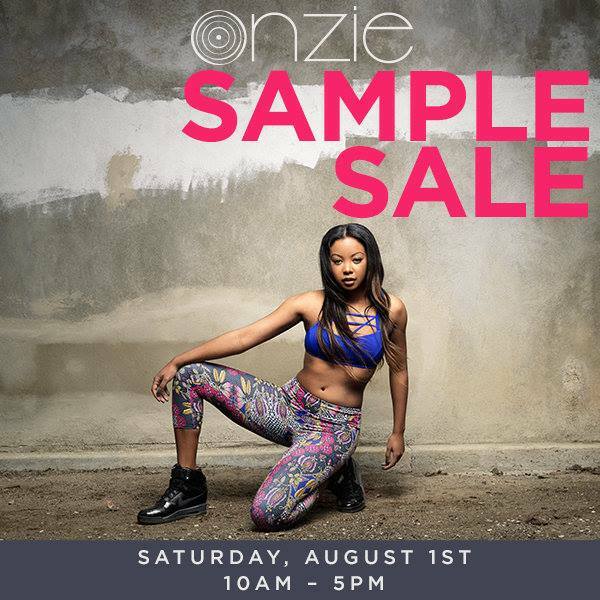 This Saturday, August 1, Onzie will be having a sample sale at Trim Hair Salon (1424 Abbot Kinney Blvd) in Venice! They will have new bra tops, leggings, tanks and one pieces with prices start at $15! Cash only and all sales are final. The first 50 customers will receive a free Onzie tote bag. Onzie was originally designed for hot yoga but has evolved to include spin crops and gear for other types of workouts. They’re known for their cute bra tops and crazy prints. A couple of my faves include their Chevron Track Leggings (they’re long but feel very light!) and their criss cross back bras. They also make a look-alike of the popular Lululemon Free To Be Wild Bra, which is called the Chic Bra in the Onzie line. In addition, they have a popular and cute cage back bra, but just be aware that it’s not as supportive as some of the other bras. Get familiar with some of their styles on their site before hitting up the sale on Sat!